American Hanoverian Society, ISR/Oldenburg, Verband der Zucher des Oldenburger Pferdes, e.V. Click for more information on Gold Luck foals. 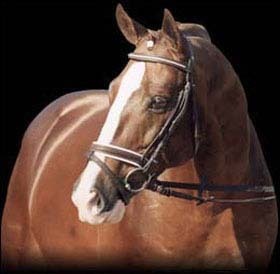 Gold Luck is by the legendary Grand Prix Dressage Stallion Grundstein, who was imported to the US in 1985 after siring 13 fully approved breeding stallions in Germany. He has been the leading sire in the FN rankings among stallions in the top 10% of their age group in both jumping and dressage since 1988. 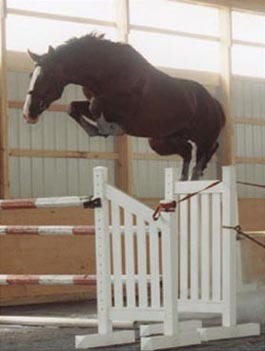 In 1995 Grundstein's dressage index was 178 and his jumping index was 142. Gold Luck’s dam, Annette by Abundance, scored 8.2 at her mare inspection. 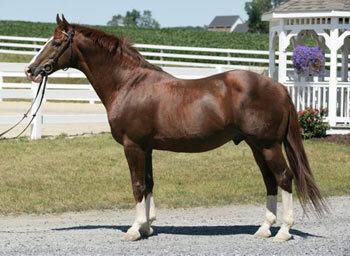 In 1995 his full sister Graphitti was the high score Hanoverian Mare at her inspection. Gold Luck shows off his jumping form in the chute. In 1995 Gold Luck was champion Stallion and Reserve Champion Mature Horse at the Royal Dressage Festival at Port Jervis, NY. In 1992 Gold Luck was Champion at First Level at Waterloo and at Grass Lakes, Michigan before Lyme’s disease ended his promising dressage career. The Lyme's disease has had no effect on his breeding, however, and he has stood to a full book of mares for many years with a very high conception rate. 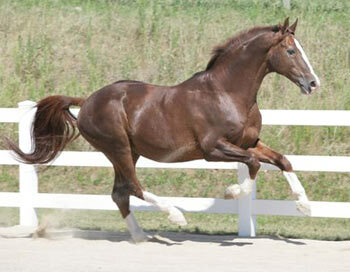 He is fully licensed and approved for breeding by the American Hanoverian Society, ISR/Oldenburg N.A. and the Oldenburg Horse Breeders' Society. The oldest Gold Luck foals are now under saddle and winning kudos from international judges and trainers in the performance arenas around the country. Many other youngsters are delighting their owners with impressive wins in breed show competition. licensing form: 7, potential: 8. 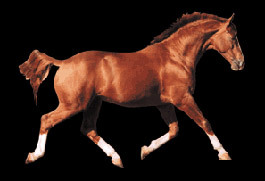 Gold Luck, shown here at age 19, strongly influences his foals' topline and neck position, and passes on a very powerful hindend – his offspring are noted for their powerful, suspended trots, ability to sit and excellent canters. Gold Luck's pedigree contains some of Hannover's most noted dressage sires, including those of the legendary Grande line. His damline also includes the influential A-line which descends from the renowned Absatz.